Wagashi, vinegar, nama yuba, and much more to be had at the Kyoto Fair at Ikebukuro Tobu. 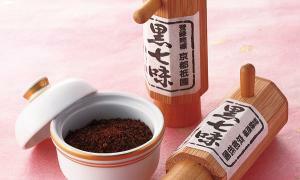 One of my favorite products in my pantry, kuro shichimi (photo) is from Hararyokaku. The black shichimi is used the same as regular shichimi, but for me it has a more mellow, rounder flavor. Thursday, March 15th to Tuesday, March 20th. 8th floor. Note the event closes at 5 p.m. on the final day. Shinjuku Keio will be holding at Kyushu Food Fair from Thursday, March 15th to Wednesday, March 21st on the 7th floor. Note that the event closes at 3 p.m. on the final day. Regional foods include karashi renkon from Kumamoto, Nagasaki castella, Saga wagyu bento, Fukuoka mentaiko, and much more.